While we had an 80s Toyota on DOTS just last week, we're really overdue to see an example of one of my all-time favorite Toyotas: the '83-86 Tercel Wagon. I've owned more of these than any other kind of car (admittedly, most were City Tow auction cars I turned around quickly, but I had a couple of drivers I kept for quite a while). I've always had a soft spot for funky old Toyotas (maybe because my very first car was a '69 Corona) and it saddens me to see how their cars have lost so much soul since the Tercel wagons, AE86s, and small pickups of the mid-1980s. The crazy thing about these cars was that the funky drivetrain setup actually worked pretty well. You had a longitudinally-mounted engine sending its two-digit horsepower back to a weirdo V-drive-style transmission, with a little tiny differential under the engine oil pan and a driveshaft going back to the rear axle (the 2WD cars seemed to have the same transmission with the rear output shaft deleted). The front and rear axles are locked together in 4WD mode, so you'd better be driving on dirt or snow (and have four tires with the same circumference) when you pop that little lever into the 4WD setting. Identify These Parts, Win More Little Tree Schwag! Honda's 4WD Civic of the same era was never able to compete with its Tercel counterpart. 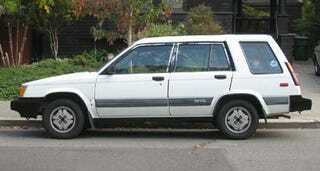 The Tercel was simpler and tougher (although the Civic was way quicker, more comfortable, and handled better). And while the Tercel's computer feedback carb can be a headache to get past a smog test, it's not in the same league as the ungodly complicated CVCC setup from carbureted Hondas of the same era. Cargo capacity is just amazing in these things, rivaling far bigger vehicles; the cargo area is very tall and the car shrugs off massive loads. I once hauled 1200 pounds of concrete several miles in a total beater Tercel 2WD wagon, and it dealt with it just fine.